Too many times my U13 got into situations where they did not find an appropriate follow-up action after a vertical pass, if the pass recipient was not able to turn. The third man principle is an important one to solve high pressure situations and to find a teammate with advantage (with an open field of vision towards the opponent’s goal). In a space, that is tight enough to force quick combinations and a game with few touches, there is a central zone set up. Playing into this central zone and playing to the third man within two touches equals 2 points. Additionally, the field gets divided vertically into two halves. If a goal is scored from the far half with a diagonal pass, it counts as 3 points. The central zone as well as the halfway line and the rewards are only an incentive to specific behavior, but do not force this certain behavior. It is important to me that players can find alternative solutions. 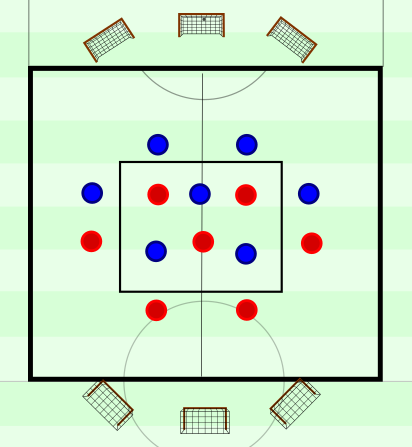 I do prefer a central oriented possession game, but if the wing is open, then the players should be allowed to use it, which is why “normal” goals count, but only equal 1 point. Pre-orientation is the most important coaching point in this exercise. It is important for all players to look for the third man. The first player playing the pass can already have a certain intention to where second player should play to. This can be communicated verbally and by the direction of the pass. Scanning and looking for a teammate is important for the second player in this passing chain, who should have decided to which teammate to play to before receiving. Constantly looking for the goals, especially to the diagonal one, should be coached so the players can decide quicker what to do, when they have this valuable information. An open body position is, as always, of high priority. I like using this exercise because it is very simple and does not need a lot of explicit coaching. The behavior I want to see is promoted by the rules, but does not restrict the players in their decision making. Because of the few rules the players can act freely, but are still guided into a certain direction, without the guiding being too aggressive.